J. Gary Dropcho putts at a practice basket near the start of the new disc golf course at North Boundary Park. 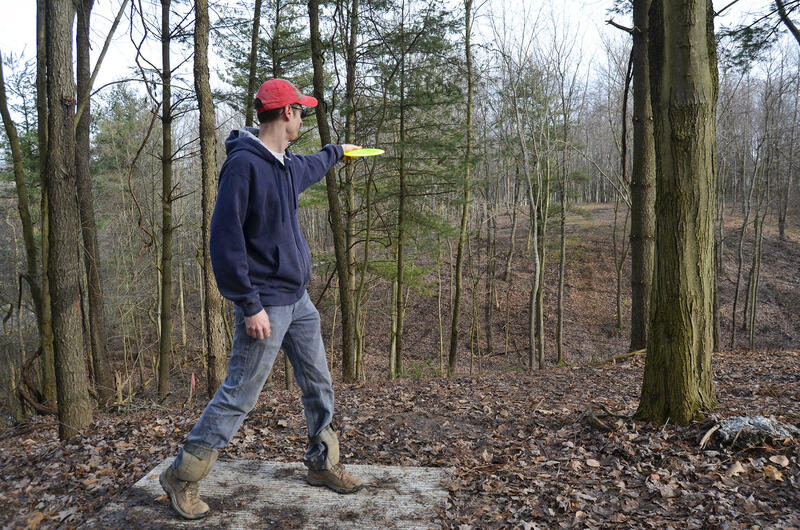 He's designed several disc golf courses in the Pittsburgh area and more in the surrounding region. It’s the product of a rapidly growing sport, but playing it won’t be just another walk in the park. In fact, participants will end up trekking through 4 miles of forest and grassy fields, plus several hundred feet of elevation gain as they snake their way up and down a hillside. “Yeah, it’s a workout,” course designer J. Gary Dropcho said on a recent afternoon devoted to building a retaining wall around one of the holes. The sport’s also pretty fun, as many people realize when they pick up a disc for the first time. Disc golf is like regular golf, but instead of whacking a ball with a club, players take a few quick steps across a tee to build momentum. They toss a disc resembling a Frisbee, though it’s smaller and heavier and it can travel further. The goal is to get the disc to land in a metal basket. Playing a round is generally free, though a disc costs about $15. The number of courses nationwide has tripled to 6,000 over the past decade, according to data from the Professional Disc Golf Association. This one in Butler County, set to open in the spring, requires players to shoot across a whopping 10,700 feet in total length. Participants will need to aim carefully so that trees don’t cut their drives short. Along the way, they’re likely to encounter wildlife. “We see tons of deer running through here, we’ve seen hawks, we’ve seen turkey,” Dropcho said. Pittsburgh-area disc golfers consider Dropcho a legend. He’s played for decades and designed multiple courses with his company, Grip It and Rip It Disc Golf. He’s even in the sport’s hall of fame at the International Disc Golf Center in Appling, Georgia. He’s seen the game change a lot since Pittsburgh’s first course went in at Schenley Park in 1988. Discs didn’t fly as far in those days, and players weren’t so skilled. Dropcho got to work designing the course by spending a lot of time walking through North Boundary’s woods with a topographical map. “Some holes are very obvious,” he said as he pointed to the first tee where players shoot over a grassy area and around a bend into a group of mature trees. Others were harder to fit into the puzzle. He knew he needed to account for a variety of shots so that players aren’t stuck with too many lengthy par-5 holes back-to-back. But players are rewarded for the climb with downhill shots where discs soar, assuming they don’t smack into a branch or a trunk. Standing on a tee, Doug Cloutier aims a disc down hole 6 of the course at North Boundary Park. He is the GIS administrator for Cranberry Township and has worked closely with Dropcho to develop this course. Dropcho’s partner on the project, Doug Cloutier, is the GIS administrator for Cranberry Township and an avid disc golfer. He hops in a cart to show off the course, driving up the hole 3 hill, which he once calculated at a 25 percent slope. On the other side of the peak lies the basket for hole 17. It’s elevated, so it’s tricky to sink a putt. Cloutier doesn’t want to miss because his disc will barrel down a drop-off on the other side. “That’s what we refer to as a death putt,” he said. He tosses a disc and it bounces off the basket, rolling down the hill until it gets caught up in some brush. “If you’re down there, it’s not only far away, but you’ve got to put in a lot of umph to get it up here,” he said. The local disc golf community hopes another course -- particularly a tough one like this -- will attract major tournaments. Western Pennsylvania got a taste for the top level of play in 2015 when the world championships took place at other courses north of Pittsburgh. “The excitement level when worlds came was through the roof,” recalled Lori Merriman, chair of the nonprofit Pittsburgh Flying Disc, which promotes the sport throughout the region. The area’s existing disc golf courses have hosted many tournaments, but that was the most prestigious to make its way here. “We had so many spectators come through just to see the top pros,” Merriman said. A lot of participants stayed in Cranberry hotels, but the township itself didn’t have a course. That caused officials to take stock. They had a parcel of undeveloped land at North Boundary alongside a water park, playground and soccer fields. Then, the Cranberry Township Community Chest jumped in to raise funds for the project. Parks and recreation director Pete Geis said tourism is one benefit of creating a course. A new nature trail will weave through the course. 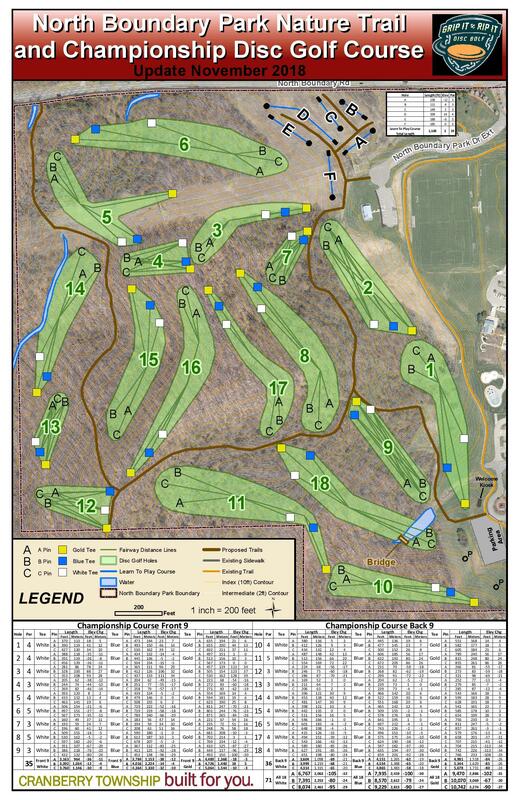 Lorin Meeder, the project’s manager with the township, said its placement is deliberate so that spectators can move about the course to view different holes during a tournament. The region’s record rainfall in 2018 caused some delay and although the tees and baskets are in and the trail’s carved out, the course is still pretty rough in some areas. One of the last steps is to get to work on a learn-to-play course set aside from the rest. It will feature six short ADA-accessible holes and will likely host clinics for kids and new players. As they get better, they can graduate to the longer course. Maybe they’ll get hooked and push this growing sport even further. In the early 1900s, Jean Hamilton became the first African-American woman to receive her bachelor's and doctorate degrees from the University of Pittsburgh. She was a leader in a field with few women, and is one of a handful of black women under consideration to replace the controversial Stephen Foster statue that once stood in Oakland. 90.5 WESA's Ariel Worthy reports on how a city ordinance that may not be enforced could have a statewide impact. Earlier this week, gun rights protesters gathered en masse at the City-County Building in downtown Pittsburgh.